Oakridge International School, Mohali conducted the Spell Bee competition at its campus. The competition was held for two categories 7 to 11 years and 11 to 14 years. The Oakridge campus abuzz with elated children from almost all the renowned schools of Tri city in huge numbers. The students were then taken through various rounds in which spellings were asked in various forms, from jumbled spellings to fill in the blanks to dictation. The students who qualified the first round selected for the second round and then the final which was an oral round comprising of 10 words. The rounds were kept keeping to gauge the understanding of phonics and letters of the alphabet. In the senior category first prize was bagged by Aditya of St. Xaviers Chd and the first runner up was Parimita Singh of Ryan International School. 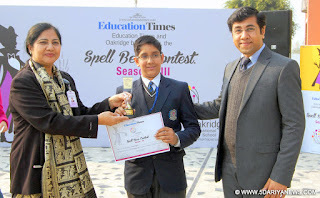 In the junior category, first prize winner was Mannat of DPS and the first runner up was Sahil of the British School. All four winners were honoured with a certificate, a trophy and a Tablet. The children and the parents were pleasantly surprised with the tablet. The Principal Ramanjit Ghuman said while encouraging the students that the activity of spell bee nurtures the child’s love towards language. Such innovative competitions are demand of the time along with the extra-curricular activities to boost energy level and confidence in children and motivate them to work hard to succeed.